Coast Spas in the UK. As a landscape gardener, I realised more and more of my customers had added a hot tub to the gardens I had designed and built. I was amazed that the majority didn’t know the brand of the hot tub, the company they had bought from had gone out of business nullifying warranties and, they could not find anyone to buy their hot tub chemicals from. We are distributors for Coast Spas. 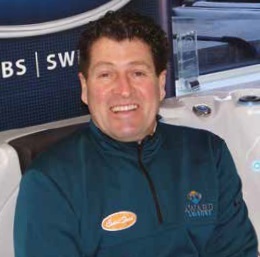 One of the largest independently owned hot tub manufacturers in the world. We have five franchised stores which I oversee. I have to manage sales staff that sell over 900 hot tubs per year and service staff that maintain over 4,000 service contracts every year. Describe your typical working day? I make sure my management team have daily plans and maintain their targets – both from a financial and customer expectation perspective. That our stores are all open and ready for business. Most crucially, I try to make sure that everyone I know and love is as happy as they can be. Delivering satisfaction to customers. Meeting and exceeding their expectations. Being satisfied that someone who is privileged to have the financial resources to buy a hot tub chooses one of our stores and buys a Coast Spa, simply, because I genuinely believe that we can offer the customer the best product, with the best service, at the best price in the world! Making sure that any potential customer finds our stores and our brand. Especially given how the customers’ shopping habits have changed dramatically since I started in retail in 1984. So, understanding and implementing current marketing and advertising strategies which are effective. Maintaining the high standards our staff provide to the customer. What’s the best piece of advice you have been given? And by whom? Adapted from Mahatma Gandhe quote: “A customer is the most important visitor on our premises. He is not an interruption in our work. He is the purpose of it. He is not an outsider in our business. He is part of it. We are not doing him a favour by serving him. He is doing us a favour by giving us an opportunity to do so”. Who are your life heroes? Eddie Stobart, Richard Branson, my dad, my brother, my uncle Maurice and Don Elkington. What about hobbies outside of work? Cooking for my friends and family, golf, my family, my garden and gin! It’s a shame there’s no real or credible qualification to separate the good guys in our industry from the chancers. My heroes in the industry are those who have stayed the course with integrity; not just taking money from customers, really caring about their actions and the products they sell or advertise. I’ve learned from some of the best. People who seriously care and are still around such as Jonathan Bunn from Hydropool, Christina Connor from Waterland, Martyn Winstone from Jacuzzi not forgetting Don Elkington and Sean Corscadden from Coast Spas Manufacturing.